The City Palace in Jaipur is one of the main attractions within the city which is visited by a number of tourists every year and throughout the year. It is a palatial palace complex containing a series of beautiful palaces and other buildings. The elegant City Palace Complex was the seat of Maharaja of Jaipur, the head of Kachhwada Rajput clan. There is a beautiful Chandra Mahal within the complex which now houses a museum, but still it is a royal residence. The beautiful City Palace Complex is located northeast of the center of the grid-patterned Jaipur city. Built between 1729 and 1732, initially by Maharaja Sawai Jai Singh II, the rule of Amer, the palace complex incorporates a vast array of impressive courtyards, beautiful gardens, and stunning buildings. Initially Raja Jai Singh II planned and built the outer walls, and later additions were constructed by successive rulers continuing up to the 20th century. 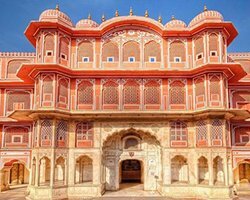 When you will visit this magnificent palace complex and explore several structures within the complex then you will have a wonderful opportunity to see the architectural brilliance which is the fusion of the Shilpa Shastra of Indian architecture with Rajput, Mughal and European styles of architecture. While exploring the palace complex you will come through several elegant palaces, stunning pavilions, gorgeous gardens, and beautiful temples. The most prominent and most visited structures and attractions within the palace complex are Chandra Mahal (also called Chandra Niwas or the Moon Palace), Mubarak Mahal (the Auspicious Palace), Maharani Palace, Pritam Niwas Chowk, Diwan-i-Aam (the Hall of Public Audience), Diwan-i-Khas (the Hall of Private Audience), Bhaggi Khana Museum, Govind Devji Temple (a temple dedicated to Lord Krishna), Mukut Mahal (the Crown Palace), and City Palace Museum. The Chandra Mahal or Chandra Niwas is the most impressive and architecturally beautiful building in the palace complex. Located on the west end of the complex, it is a seven- storeyed building. Each floor of the Chandra Mahal has been a specific name such as Pitam Niwas, Chabi Niwas, Sukh Niwas, Ranga Mandir, Shri Niwas, and Mukut Mahal or Mukut Mandir. You will be amazed to see unique paintings, beautiful mirror works on the walls and stunning floral decorations while exploring the Chandra Mahal within the City Palace Complex. The Vaisnava Govind Dev Ji Temple is also a key attraction located outside the walls sent a garden environment. Dedicated to the Hindu god Lord Krishna, the temple is known for European chandeliers and paintings of Indian art. The ceiling in the Mandir is ornamented and decorated in gold. Other attractions too will give you pleasant experience of seeing Indian rich art and architecture. In general, the City Palace in Jaipur is a must visit. So, don’t forget to visit this arresting and impressive palace complex on your Jaipur sightseeing tour.